From the moment he sees Amy on a Hong Kong subway, Simon wants to talk to her. But when he finally works up the courage, he finds out he can’t. Because Amy doesn’t speak Chinese, and Simon is failing English. But despite their language barrier, Amy and Simon connect, and they discover they understand each other. In this stunning first novel about class differences, cultural arrogance, unwanted pregnancy and abortion, sexual double standards, and love and friendship, two vulnerable teens carve out a relationship even though each seems way beyond the reach of the other. 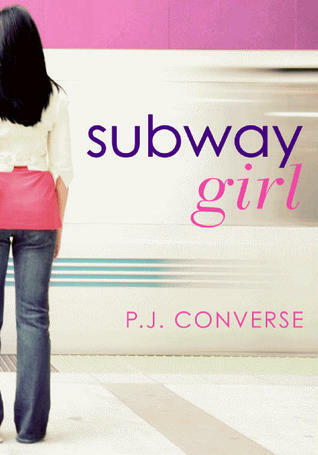 Every time Simon sees a young and beautiful girl in the subway, he has daydreams about a chance encounter. Simon is not an outspoken guy, but when he finds out that he will probably fail out of school - no thanks to his English course - he figures he has nothing to loose and summons up the courage to speak to her. Things don't exactly go according to Simon's plan. Amy, 'Subway Girl', doesn't speak Chinese, she is actually American. Simon fumbles his way through the conversation and vows to give this whole English thing another try in order to win Amy's heart. Amy, on the other hand, is too busy dealing with her parents marital problems and hanging on to her older boyfriend. I jumped at the chance to read a multicultural book with Chinese American characters, but this book fell short for me. I was royally confused with the dialogue. It was not Simon's broken English (I'll talk about that later). It was the fact that the conversational passages were short, choppy, and without clues as to whom was speaking. Back forth, back forth. I had to reread several passages over again when I lost track. After three or four times, I didn't think it was just my lack of reading abilities. I normally like quick dialogue, it makes the scenes unfold as if I was watching it before my eyes. The supporting cast of characters were also.... Simon had a handful of friends that would periodically enter a scene and just seem to take up space. They were completely obnoxious - in the book and for me. They added very little depth to any discussion or add to the story. In my opinion, they were simply in the way. Amy also had a few friends that just seemed to be there. I had no idea what purpose the supporting characters were. Every time Simon and Amy would say their name, I would say to myself, "Who?" On the other hand, Amy's sorry-a** boyfriend had character. Whew, what a jerk! It pains me to think that there are real people in the world just like him. He was not confusing to understand at all. It's boys like this that make me want to lock up my daughter's until they are 35. Back to the language. I liked Simon's broken English, it added a sweet and vulnerable quality to him. He was a likable character. When Simon comes to Amy's side in her hour of need, my heart ached a little for him. While he was Amy's hero, it made me not like Amy at all. Simon's willingness to drop everything and anything for Amy made Amy look like a user. It didn't seem to be a reciprocal relationship. For instance, I would have liked to see Amy learn a little more Chinese. She seemed to have no interest and this frustrated me. Simon put himself out there repeatedly, and Amy didn't. I wish she grew more...as a young lady. This is just a personal preference, didn't really have a lot of bearing on review. Bottom line: The multicultural element of language was a standout while character issues were a downfall. I think if I was less confused, I would have rated better. I am sure others will feel differently.